Though he rose to prominence and perhaps remains most famous as the guitarist of pioneering ’90s alternative/rap metal outfit Rage Against the Machine, musician and activist Tom Morello has had an incredibly busy and prolific run in the near two decades since Rage first split (they returned in 2007 and spent a few years playing big shows, but not much else came of it). Supergroup Audioslave (with the late Chris Cornell) brought Tom an admirable second act in the ’00s, and more recent supergroup Prophets of Rage has proven RATM’s unlikely ability to function without famed frontman Zack de la Rocha, subbing in members of Public Enemy and Cyrpus Hill in his stead. While also participating in other projects, collaborating with huge artists like Bruce Springsteen, and generally remaining an esteemed figure in the rock scene, Morello has also found time to function as a solo artist, beginning first with a folk and acoustic project he dubbed The Nightwatchman, a moniker he’s used to release several great albums of protest songs under since the mid-00s- his last release arriving in 2011. More recently, Morello has stepped out for the first time to craft an LP under his own name, The Atlas Underground, which arrived this fall with a fusion of Tom’s hard rock, alternative, and hip hop leaning past, recruiting a staggering group of collaborators- Knife Party, Bassnectar, Big Boi, Killer Mike, Portugal. The Man, Whethan, Vic Mensa, Marcus Mumford, Steve Aoki, Tim McIlrath, K.Flay, Pretty Lights, Carl Restivo, Gary Clark Jr., Nico Stadi, Leikeli47, GZA, RZA and Herobust- and returning Morello’s fiery passion for social and political activism. In support of his latest, Morello has been playing new tunes (and, of course, some familiar hits) at intimate venues around the country, a rare chance for fans to see the seminal guitarist in rooms way smaller than other of his other bands ever play. Tonight, Dec. 11, the tour hits Nashville’s own 3rd & Lindsley, and while tickets- still available here– aren’t cheap, it’s sure to be a cool, engaging, and unforgettable experience for longtime Morello admirers (and will quite possibly include some special guests). Don’t miss it! 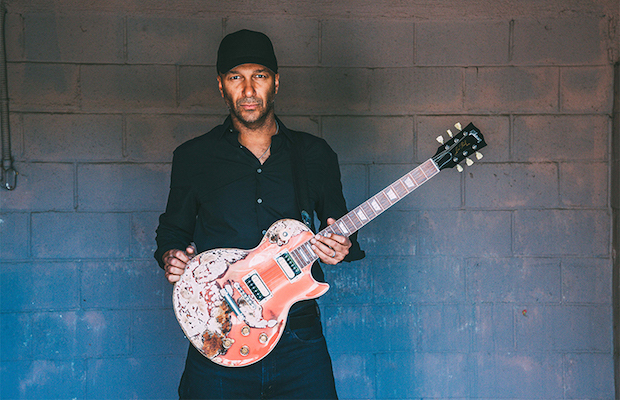 Tom Morello brings his Atlas Underground Experience to 3rd & Lindsley tonight, Dec. 11. The show is all ages, begins at 8 p.m. (doors at 6:30 p.m.), and tickets are available to purchase for $55.